A bill of sale form is the single most valuable tool for conducting serious transactions. 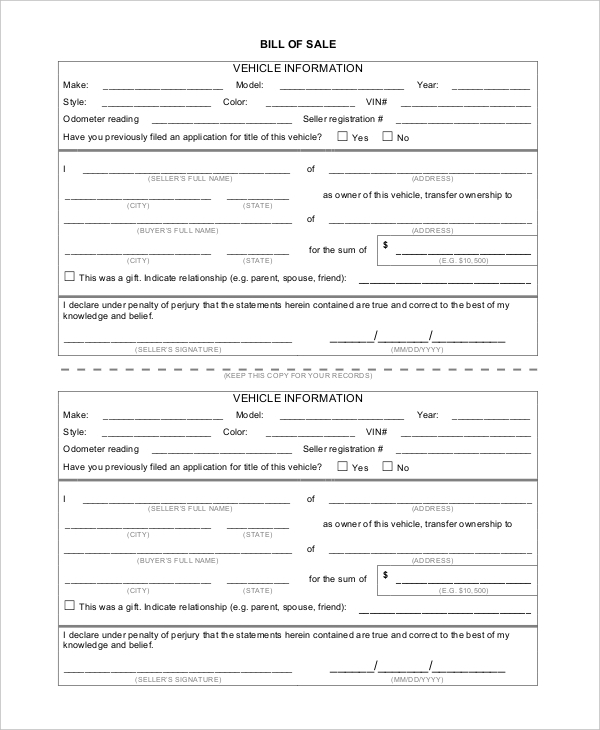 For example, if you intend to buy a car from a dealer, it will be necessary that they fill this form and input their signature to show that they indeed agree and are willing to transfer the ownership rights of the car to you. Bill of Sale Form appears in the Common Law of the United States of America, which means it’s important to respect the document. Before buying a car “AS IS”, consider having a clean deal with the seller. That means you need to have them fill and sign this form as an insignia of their agreement to seal the deal and transfer ownership rights. 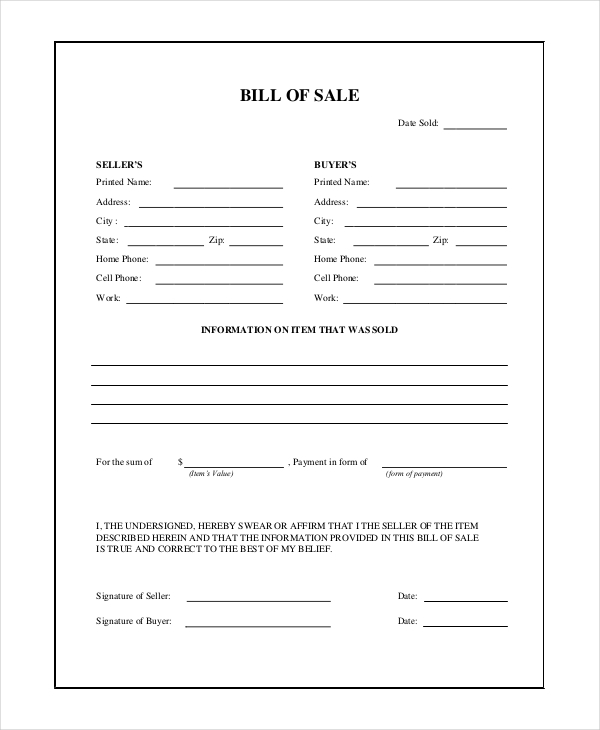 A blank bill of sale form is a perfect template for those who would like to compose their own buying or selling rules. It’s best to make sure the form has the necessary data to avoid transaction inconveniences. The form must have simple content, the signature of the buyer and seller must not miss, and the dates of the transactions must reflect at the bottom of the page. 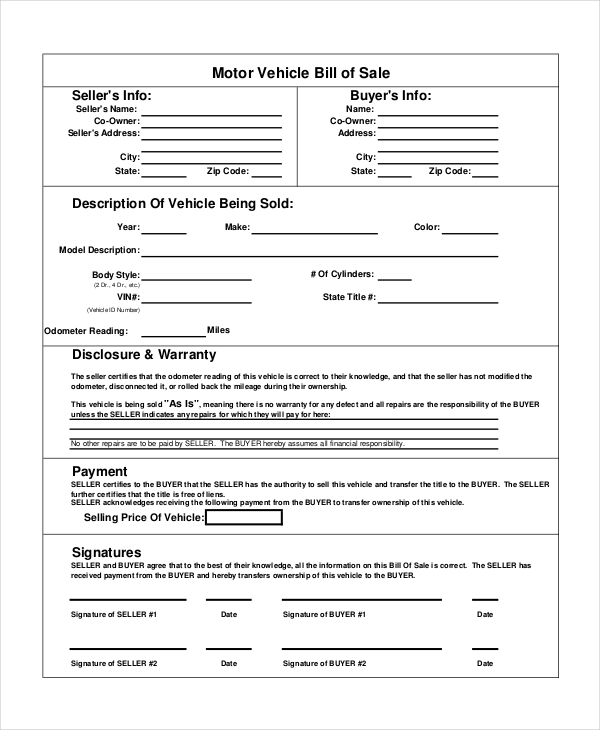 Sellers can download the sample form template PDF and customize it into a personalized bill of sale template for automobile transactions. The buyer and seller must sign the agreement to seal the transaction. 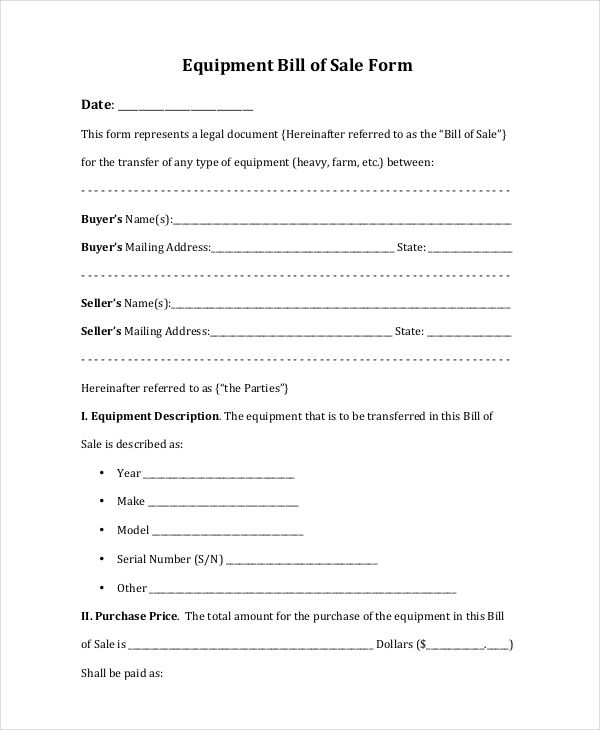 Even if you are selling equipment to a friend, you still should sign a bill of sale form as a sign that you agree to transfer the ownership of the equipment to the new buyer. Before buying a motorcycle, ask the seller if they transfer ownership. If they do, have them fill this form. If they don’t transfer full ownership to buyers, cancel the deal. Be safe, and buy carefully. 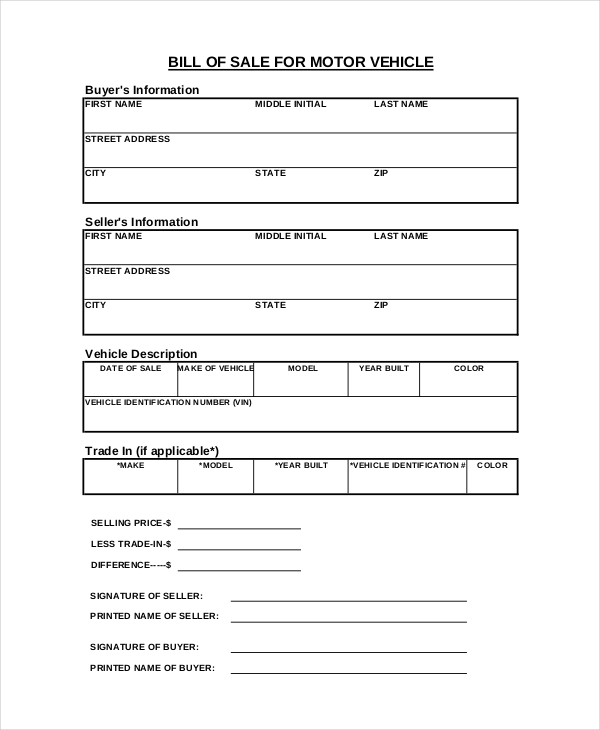 Best designed for sealing car deals, this form will help you transfer ownership and rights to the new buyer within the shortest time possible. The template is easy to customize, and easy to use. 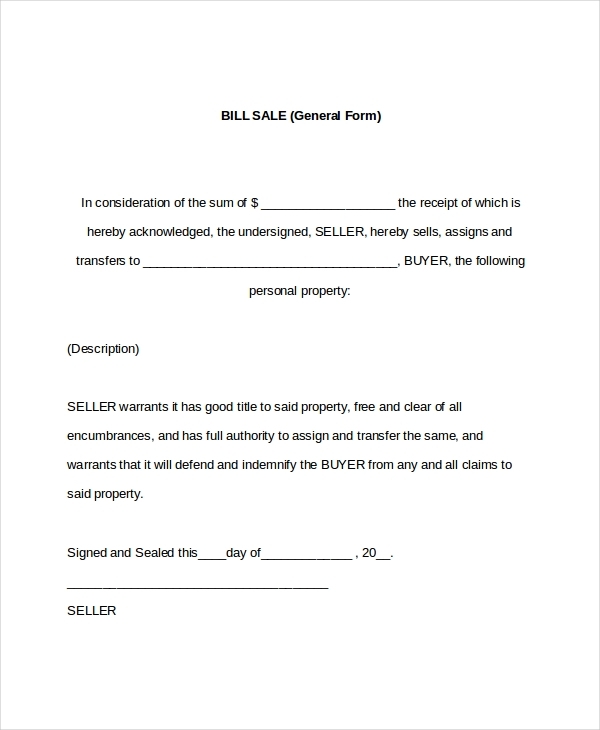 What is a General Bill of Sale? Sale of goods like cars and other electronic equipment is often quite stringent. 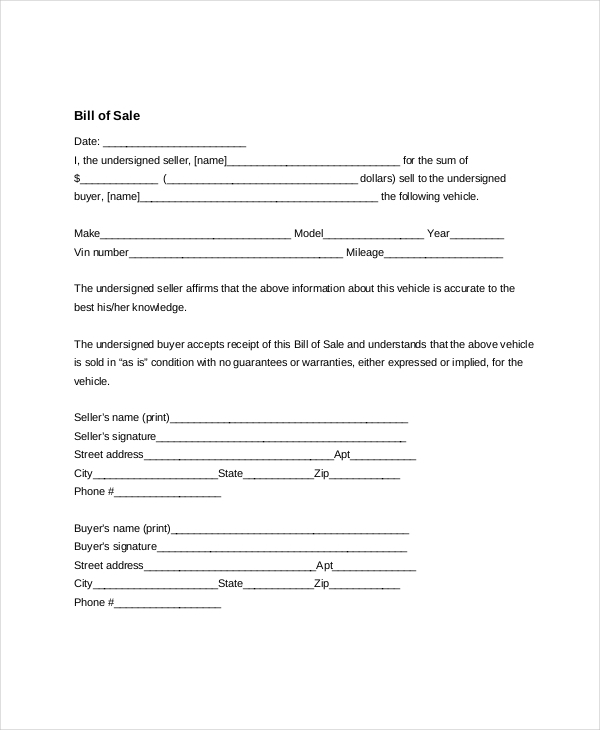 So, when you buy a car, land, or a house from a dealer, ask them to fill a bill of sale to signify the complete transfer of ownership. Keep the original and photocopied documents safe for future use. Anyone can use a printable general bill of sale form as long as he or she intends to transfer the goods already owned. It’s not according to the law to fill and sign this form if the goods in question do not belong to you. If you are transferring ownership on behalf of someone else, you should consider seeking their permission first.